Is there anything more heartwarming than a blind dog? Maybe a very obese cat, but a blind dog has to be close. 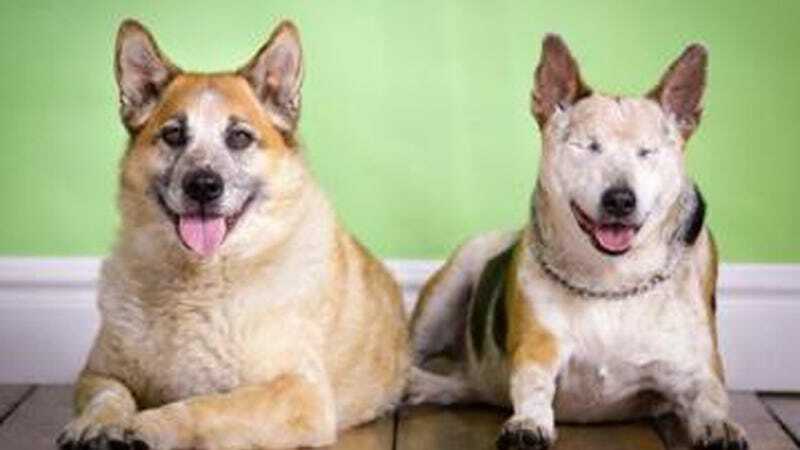 Upping the tragic adorability is the fact that Chico, blind dog from Denver's MaxFund Animal Adoption Center, is up for adoption with Jack, his seeing-eye dog companion. I mean, COME ON. It's like adopting a muppet, and then getting Fraggle thrown in for free! Greetings! My name's Chico and I'd love to meet you to see if we could live happily together! I'm easygoing, loving, affectionate, and hoping to please you as your new companion. I love other friendly dogs, especially Jack, a cattle dog buddy I'm used to hanging with and hope to be adopted with, if possible. You see, I've used dog doors, the scent of treats and other friendly dogs like Jack to help me get along just fine despite my loss of vision. I'm smart and can open gate latches even though many "sighted" dogs couldn't master such a feat! I'm easygoing, friendly, love walks, car rides, water, know "sit" and "come," and I'll brighten your days and make you smile. So come meet me, okay? I can't... I have to adopt all the dogs! How can I live in a world where I don't get to hang out with Chico and Jack every day?? Denver, it's on you to get these two into an awesome home — don't let the world down! !